When the STEM-minded educators at Oak Hills High School in Hesperia, Calif. wanted students to get hands-on with professional AutoCAD and video production software, the system requirements outpaced their current PCs. They needed to overhaul the computer lab. Instead of dialing up a vendor to install brand-new workstations, tech-ed faculty ordered computer parts and components that students themselves assembled. Building a workstation PC costs less than buying pre-built. Incorporating it into student coursework? That’s a proper lesson in DIY efficiency. Computer building has always been a course requirement for IT Essentials class at Oak Hills, part of Cisco Networking Academy curriculum designed for students to pursue professional networking certifications before high school graduation. Many schools have students break down old computers and put them back together to meet the requirement. “My focus is to mirror the industry,” says IT instructor Mark Smith. “An IT technician will be working on older computers to fix them; however, when a client wants a new computer built they want new parts.” OHHS went the extra mile this year and did a lot of both. Working in groups of three or four, students assemble the PCs in a week of class time—about three hours total with pack-up time—and worked on the same computer each period. “The vast majority had zero prior experience,” Smith explains about students entering IT Essentials. They take apart old PCs down to the motherboards as primer for putting new computers together. Smith also teaches the Internet Engineering I course—the next-level class for network management pupils—these students are finishing assembly for an additional 30 workstations. They conducted PC builds last year and take a more assembly line approach, cementing last year’s skills to muscle memory. “I have to throw props to my advanced class,” Smith says, impressed with their professional approach to the process of building out the new lab PCs. Mr. Smith is quick to recognize that support from school administrators—namely Principal Michael Capps and Assistant Principal Matthew Johnson—catalyzed the CAD lab build project. “They asked if my class would be interested in building these and I jumped at the opportunity,” he says. It isn’t difficult to understand why administration felt confident the program would be in good hands. As a side business, Smith repairs and builds custom PCs—something he’s done since the Windows 95 era of computers. He has used Newegg almost exclusively for computer parts during the past ten years, he told HardBoiled. Leveraging a state industry pathway grant allowed Oak Hills to build for quality and longevity, reflected in the components selected for the PCs. It was the difference between installing AMD FX-6300 and Haswell Intel Core i5 processors—sufficient for the short term—and the current generation Skylake Intel Core i7 and AMD FX-8350 chips that Smith opted for the computers, which will give the PCs more shelf life. How did NeweggBusiness help the project come together? Assembling 44 workstations in two week window of class time presents a number of fulfillment challenges that NeweggBusiness account executives specialize in solving. For the Oak Hills CAD lab, Smith worked with AE Stacey Jouglet, a K-12 procurement specialist, to navigate the fulfillment—quote approval, processing required documents for the grant, and orchestrating inventory shipments from several warehouses to arrive in a neat and timely manner. Read more about how NeweggBusiness helps schools that build PCs. 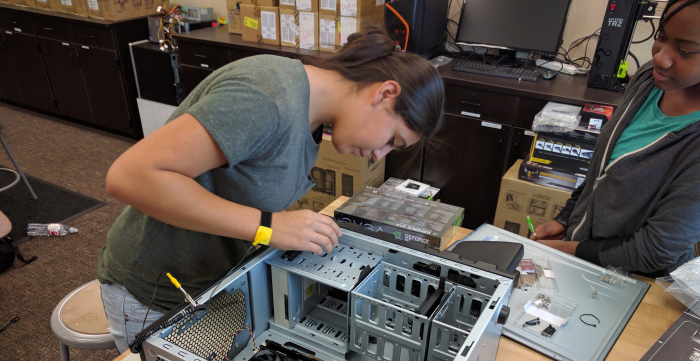 Instead of dialing up a vendor to install brand-new workstations, tech-ed faculty ordered computer parts and components that students themselves assembled. Building a workstation PC costs less than buying pre-built, and incorporating it into student coursework? That’s a proper lesson in DIY efficiency. I think that experience will benefit the students greatly and save the schools some dollars as a bonus by avoiding the middle man markup, great job.